Ingenuity meets classiness – this in a nutshell defines the aptly named Moment candlestick conceived by Norwegian designer Lars Beller Fjetland. 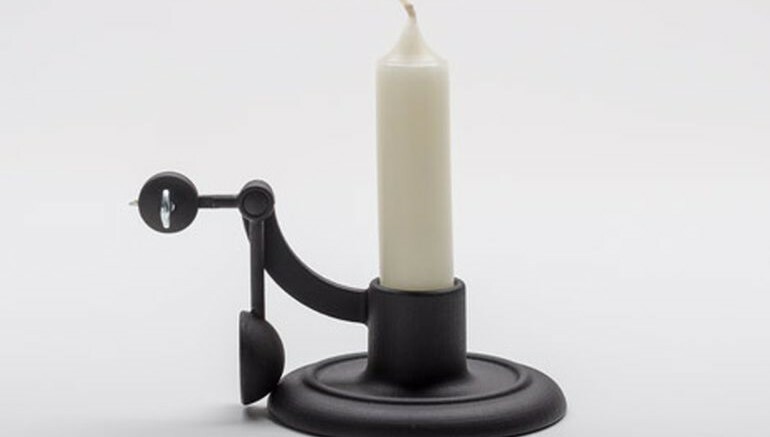 Produced as a commercial collaborative effort from Danish brand Hay and British designer Sebastian Wrong, the cast-iron candle holder can self-extinguish when the wax form has reached its bottom level. This simple yet ingenious action is achieved by a self-functioning pendulum mechanism which has a needle-like projection at its end. The ‘needle’ can be inserted into the wax somewhere along the lower level. So as the wick burns, the wax continues to melt, until it reaches a ‘threshold’ level. This in turn releases the needle, thus making a domed cap swing down on the flame to extinguish it (check the GIF image after the jump). However, beyond simplicity and gravity, there is also the aesthetic side of affairs when it comes to designs such as these. To that end, by the designer’s own admission, he was seriously inspired by a collection of 19th-century candelabra. This can be somewhat deduced from the intentional use of ‘heavy’ cast iron. The matte nature of the metal’s hue provides a pure contrast with the bright glow of the simple candle flame. Lastly, as for debuts and demonstrations, the Moment candlestick was showcased as a part of the latest Wrong for Hay collection at the Maison&Objet trade fair in Paris. Via: Dezeen / Photography and movie are by Sjur Pollen.